I knew it was too good to last. I knew the whining and tantrums would start back up soon enough. I knew my patience would eventually be depleted. I just wish it hadn’t happened as soon as it did. I had two glorious afternoons/evenings this week with just me and the kids. Monday and Tuesday were great. I picked the kids up from the bus stop. We enjoyed a snack together. We got through homework without any major meltdowns. We played together. Then they played together while I cooked a nutritious meal. We enjoyed a family dinner and watched our favorite TV shows in peace. Bedtime even went smoothly. On the first day I thought to myself, “Wow, I’ve finally got this down. I can actually do this!” Then it all happened again. 30% of my brain thought, “I’m doing great. They’re doing great. Have we reached a new stage? A good stage?” But 70% of my brain thought, “This can’t happen every night. This is too good to be true. When will the other shoe drop?” And sure enough, by Wednesday, the whining started back up. The fighting reared its ugly head again. So that’s it. Maybe it’s not too good to last. There will be good days. There will be bad days. But I can’t let the bad days pull me down. Let’s see how long this new resolve of mine lasts, especially with some single parenting nights and weekends coming up. Please stay positive with me! We have officially finished celebrating Mason’s 8th birthday, so I feel that I can finally write this post. 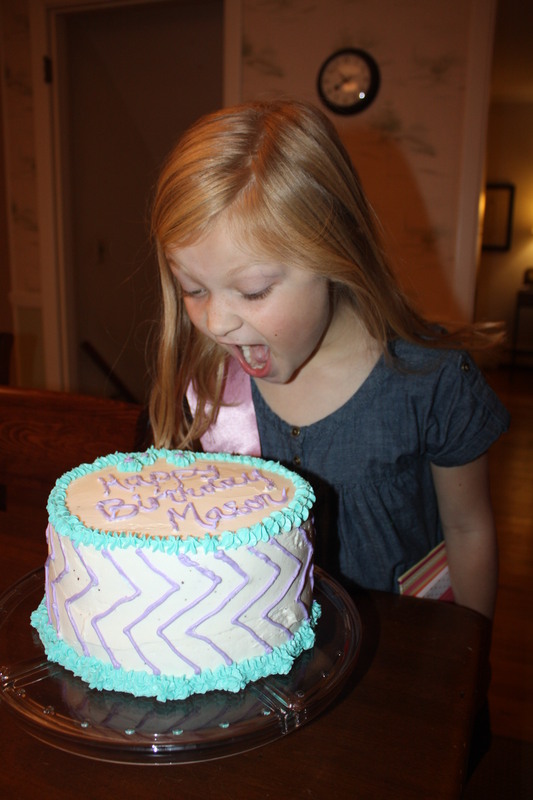 The majority of Mason’s celebration was last weekend and on her actual birthday. But she just had a party with 5 of her closest friends, so now we can all move on. Not that I don’t love celebrating, but I’m glad to have this party behind us. I could probably do a whole other post just on the drama and craziness of having six 2nd grade girls over, but I’ll just leave it at…. Whew! We made it! First of all, I can’t believe Mason is 8 now. I don’t have her stats (height, weight) at this point since she goes in for her annual checkup on Tuesday. I do know that she has grown a lot in the past year. Physically, mentally, emotionally… Has it really been 8 years since this? 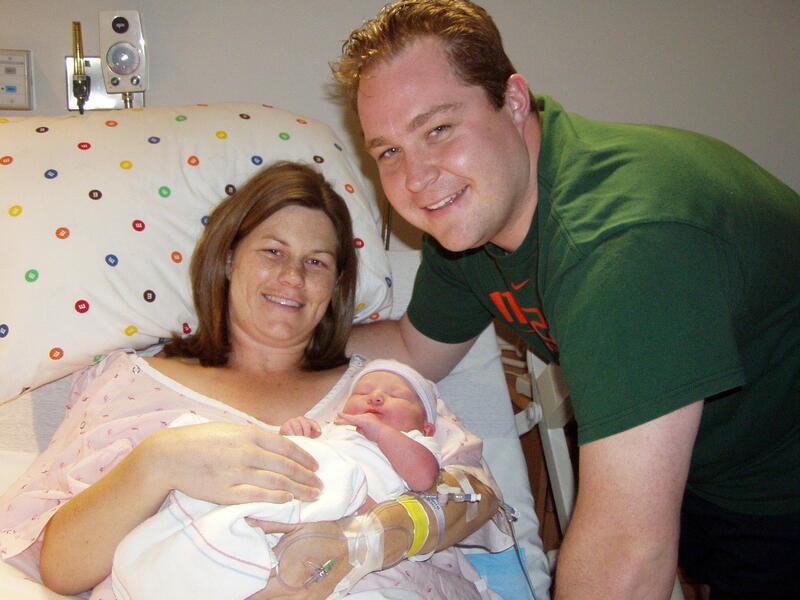 Somehow we survived, and here is my baby girl today. Can you tell she loves her birthday? 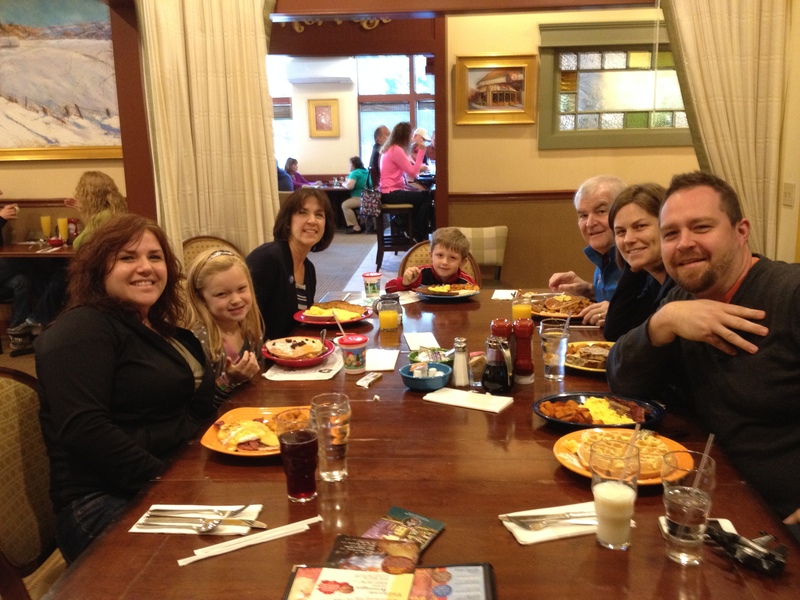 It was even more exciting since we had Nana, Papa and Kristin in town. While the whole weekend was NOT focused on Mason’s birthday, we still made sure to have some fun using the family gathering as the excuse. 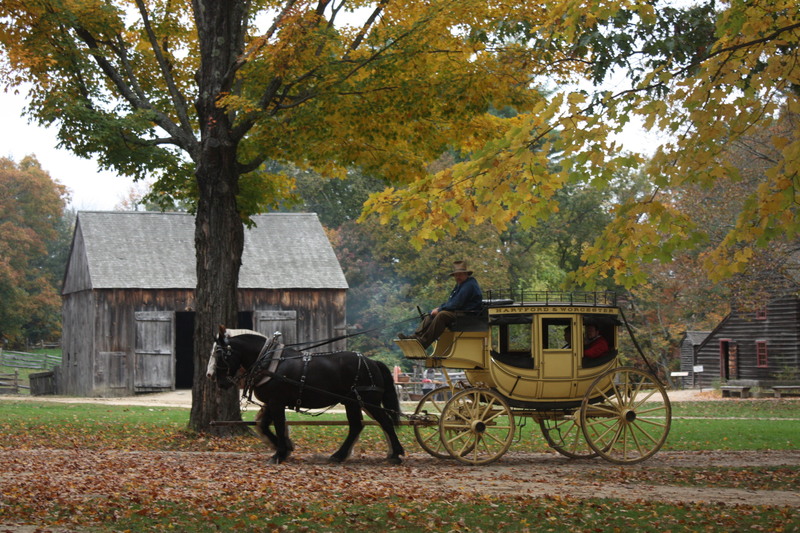 On Saturday we rented a minivan and headed to Sturbridge Village in Mass for a little history among the fall setting. Luckily there were a lot of games for the kids to play. 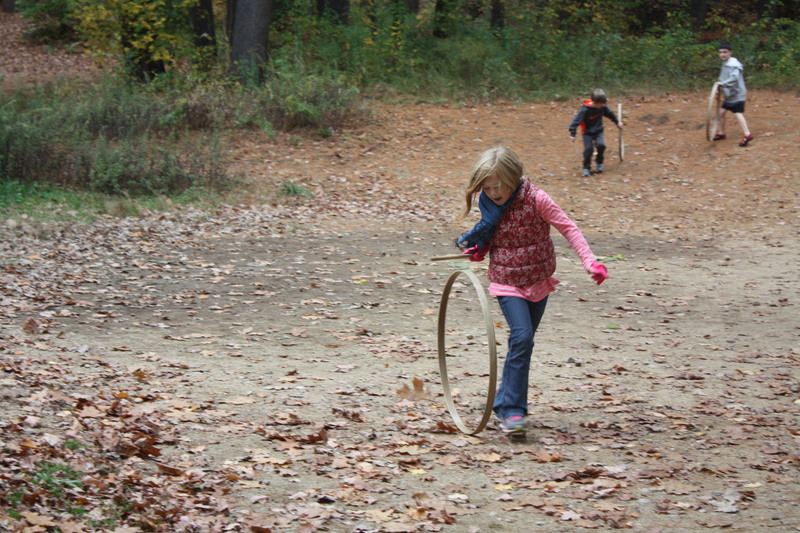 They were actually quite good at the trundling hoop. 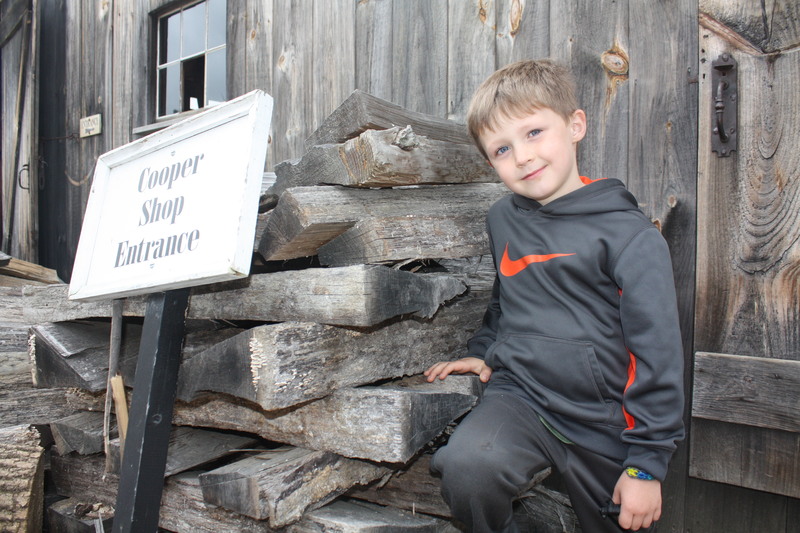 Wouldn’t be a history lesson without showing Cooper where his name comes from. 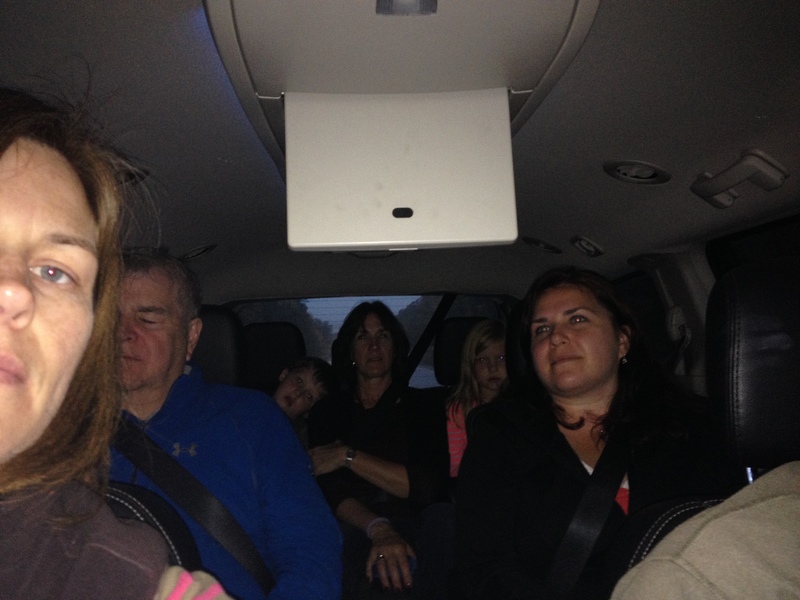 Everyone enjoyed the minivan features for the long ride home. Sunday was the official day of rest…. 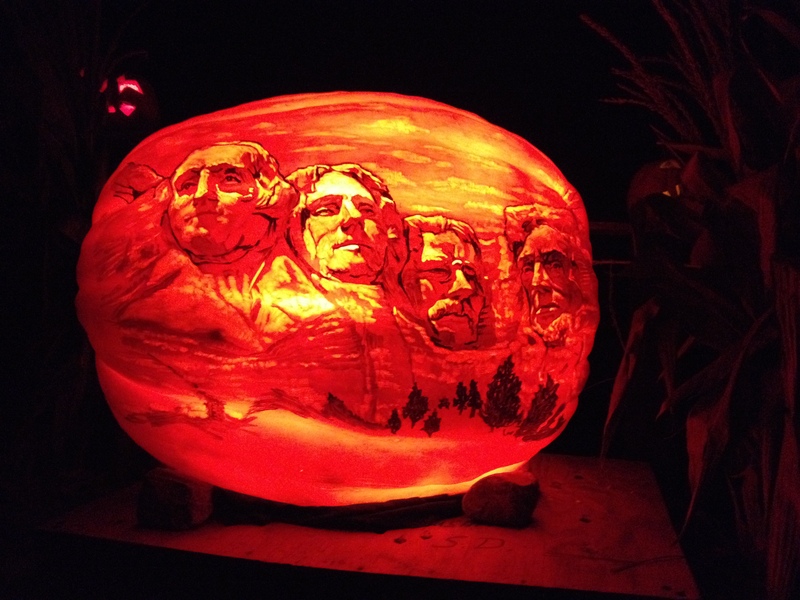 ending in the very long wait to see the Jack-O-Lantern Spectacular at the zoo. Despite the long wait, it was pretty impressive. Official birthday breakfast at T’s. They even gave us the special room. 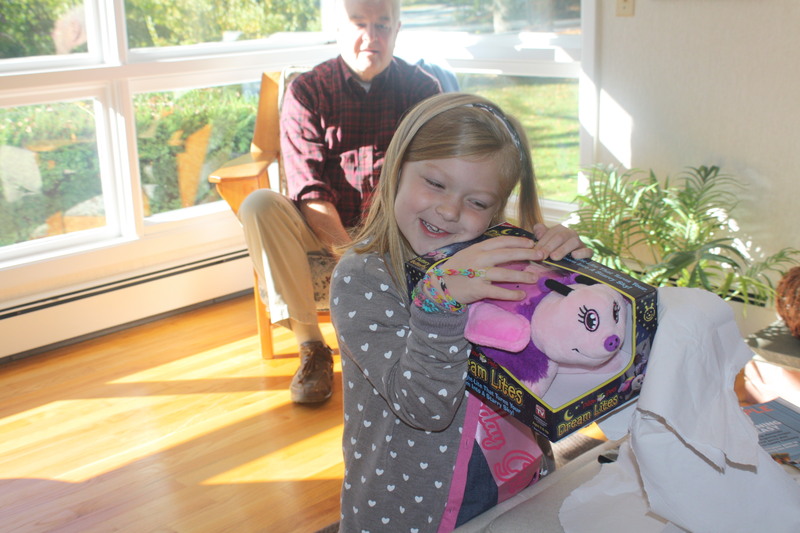 Mason loved opening her presents! She is one lucky gal. 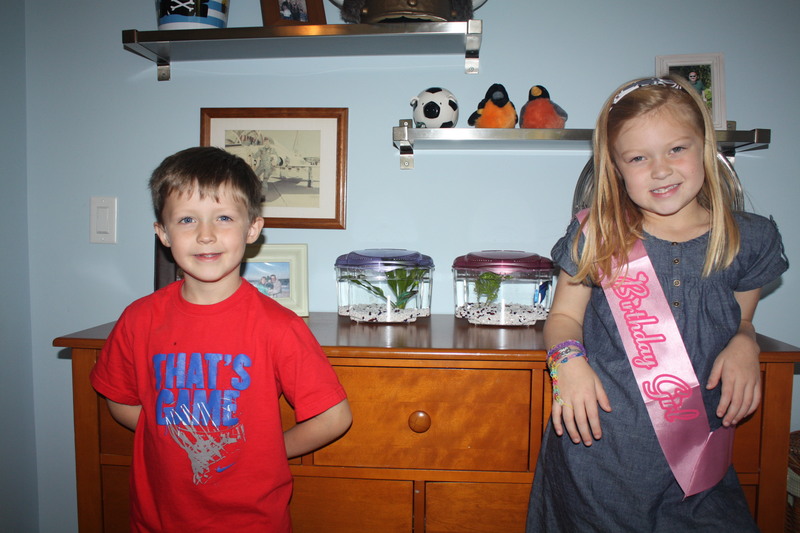 The big surprise, though, was getting her and Cooper their first pet! A betta fish for each. They’ve been quite the hit all week! Happy Birthday, Mason! Your daddy and I love you so much and have enjoyed watching you grow over the past 8 years. I just realized something, though…. This means we’re halfway to 16. Hubba-wha? I can’t even begin to think of that birthday celebration. So for now, I’m just going to relish in these special moments. 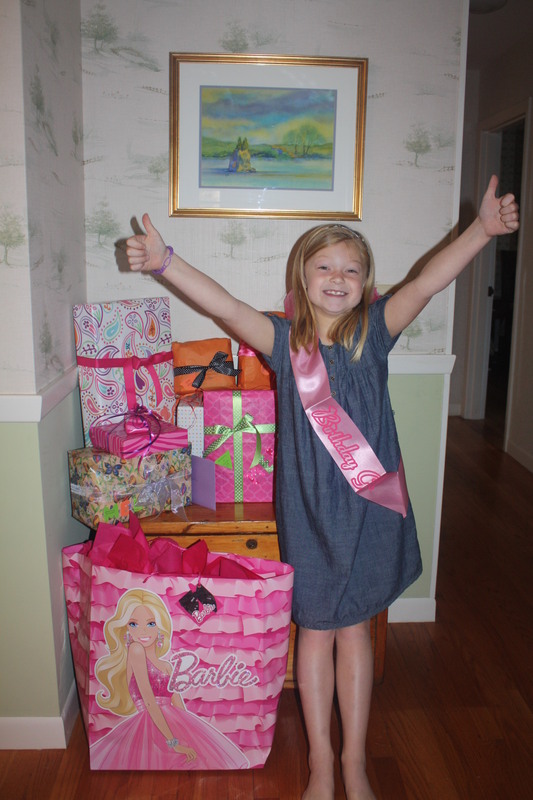 And in another 8 years, we’ll look back on this post (and all the other birthday posts) and wonder where the time went…. and be thankful for all the wonderful memories in between. Yesterday marked 21 years since my dad’s accident. While not a big milestone (like last year’s 20! ), it’s still a day that my family takes to reflect back on my dad’s life and the memory he has imprinted on us and those around us. I don’t usually make a big deal about it outwardly. I reflect throughout the day, look over pictures, and generally just try to live my life the way I think would make my dad proud. Some years I watch the amazing slide show video that was made for us all those years ago. And some years I’ll tell extra “Grandpa John” stories to my kids. Sometimes it’s just the little things that help me through the day. October 7th snuck up on me this year, though. I’m thankful that it happened to be a Monday, which is when I work from home anyway. I had a little more time to reflect than I would have being at the office and rushing through my day. My mom posted a few pictures and memories on Facebook, so I thought, why not? I’ll put a few up too just as a quick honor to my dad. What’s amazing is the outpouring of love received. 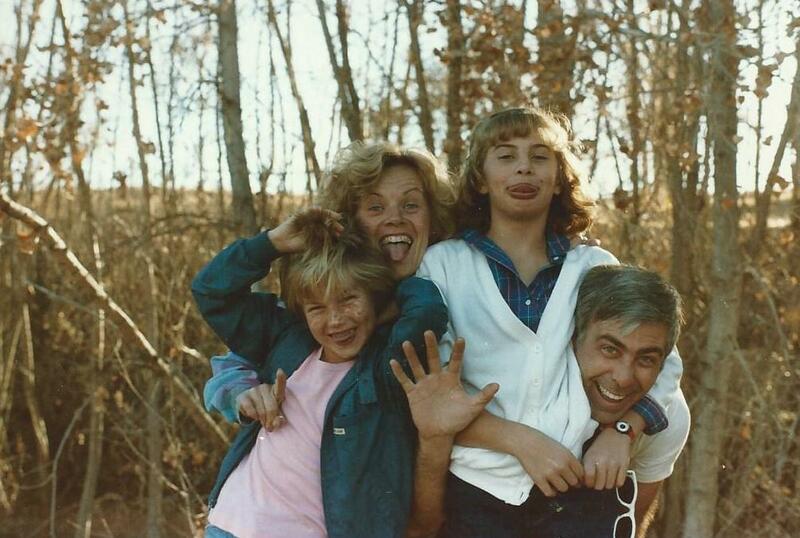 So many of my own friends were influenced by my dad’s short life. They were there for me and my family as we struggled to heal. They were there to keep my dad’s memory alive. And they were there for me yesterday – commenting with memories, words of love, and just the fact that their lives were changed (even if just a tiny bit) on that beautiful fall day 21 years ago. And even those people who never knew my dad but have come to “know” him through us are always there with just the right words to honor his memory. I am so grateful to all of you. Thank you for making yesterday easier with your kind words and your loving memories. And to two of my oldest friends (you know who you are), who were locked up in my bedroom with me that afternoon… I’ll never know truly how that day affected you personally. But I will always remember how your friendship and love affected me on a day I felt my world crashing all around me. The laughter and tears we shared that day are forever imprinted on my heart. And you never let an October 7th go by without reaching out – either with an email, a text or a phone call. Thank you doesn’t even begin to express how I feel when I hear from you. But I’ll still say it – thank you… for yesterday, for last year, for 21 years ago, and for every year in between.